It's my turn over at the Great Impressions Blog. I was inspired by my teammate Kendra and had to use non-traditional colors for today's Christmas card. I went outside my comfort zone for this. I used papers from Stampin' UP and these awesome festive stamps from Great Impressions. 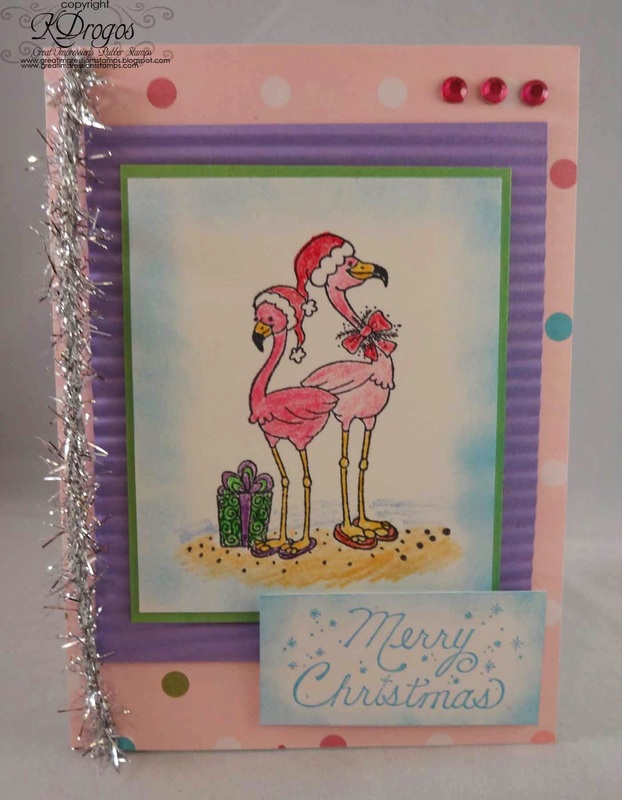 The stamps that I used are G446 Holiday Flamingos and D378 Merry Christmas Sparkles. I used a hand held crinkler for the purple. Down the left side is the Tim Holtz silver tinsel. I used Blue Hawaiin Powder Puff ink by Quick Quotes for the sentiment. Then I sponged the color the focal point and sentiment. Be sure to check out our current challenge too! And for some added inspiration be sure check out our Pintesert boards and Facebook. Thank you for stopping by! Until next time my friends...Have a great day! Sooooo cute! LOVING the flamingos!!!! !